You know how I post pictures of me wearing my handknits (often when I have no knitting progress to share) and call the series “knits in action”? 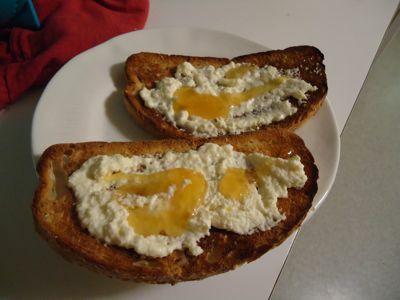 Well, I took one look at this photo of my first batch of Deb’s ricotta, smeared on toast and drizzled with honey, and all I could think was, RICOTTA IN ACTION! We’ll see if this becomes a companion series to my photographs of handknits. Remember, you have until the end of today (Wednesday) to comment on Friday’s post for a chance to win Killing the Darlings by Pearl and the Beard!